This entry was posted on December 19, 2010 by iheartfilm. It was filed under Black and White, Ilford Delta 100, sculpture and was tagged with Black and White, film, Ilford Delta 100, nikon f100, noritsu koki, photography, sandsculpture, sculpture, virginia, virginia beach. I love this shot! Is this another sand sculpture? I love that one, especially the mission-type church. Nice tonal range. Detail in the dark areas and highlights. Do you adjust your developing times to suit the conrast range of the scene? A very interesting and artistic capture indeed. The tonal range is great here. reminds me of Greece – lovely! Great picture! I’m gonna reiterate the question above: what is that? Sand? All your pictures are really amazing! 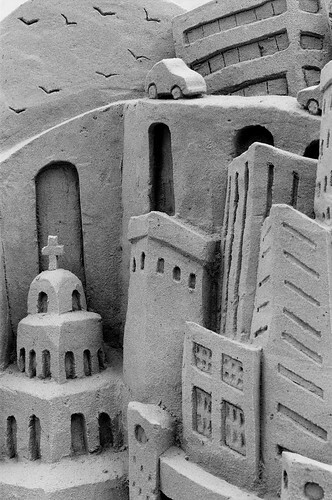 this is amazing sand sculpture, and your blog has amazing photos!